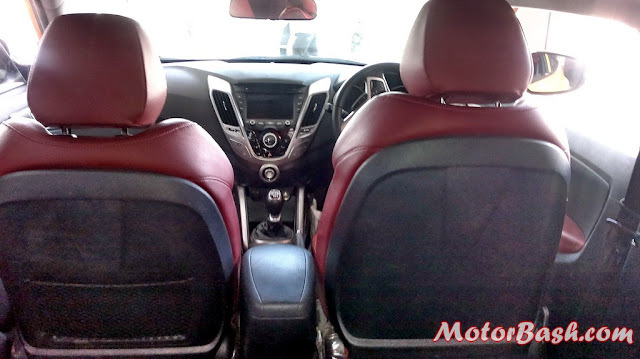 Hyundai Motors India Limited, the korean subsidiary in India is known for the design language of its cars. Starting from Eon to i10, i20, Verna, Elantra and Sonata all are fluidic in design language. Infact, Verna and Elantra and even the highest selling cars in their respective segments and others cars do pretty good in numbers. Overall, the Korean carmaker has 20% market share and is on second spot in the Indian Automobile market. In case you remember, the carmaker displayed Veloster at Auto Expo 2012 (View images here) and there was plan to launch the car in India. The carmaker however has not decided anything as of now, but seems like it is already in plan and the actions have already started taking place. 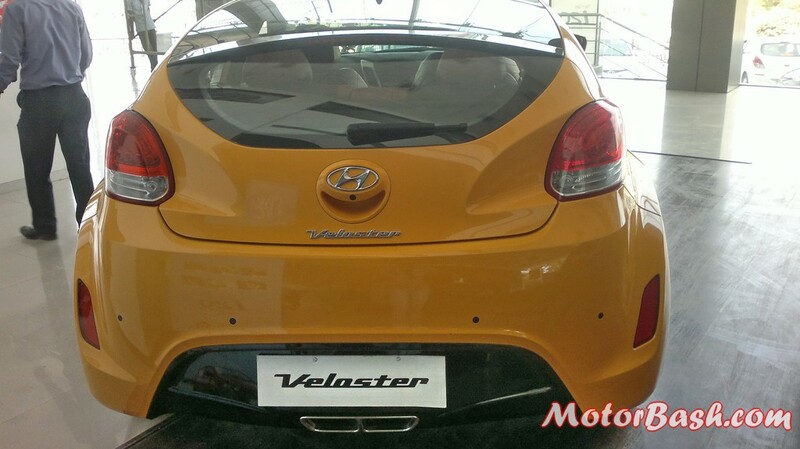 The car is now displayed at some of the dealerships in India with Garve Hyundai at Pune being one of them. It has also come to light, that the car is on display only till 25th April 2013. 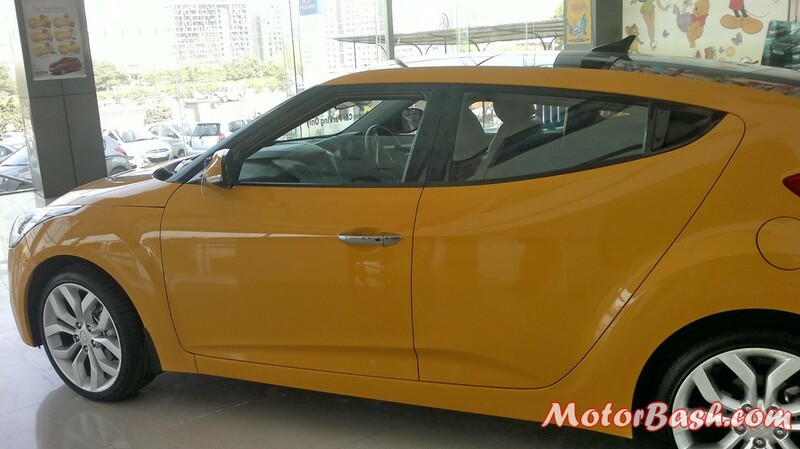 As per source, Motorbash, the car is on display to test the level of exciteness among the Indian market for Veloster and gauge the market response. Here are some pictures brought in for you. 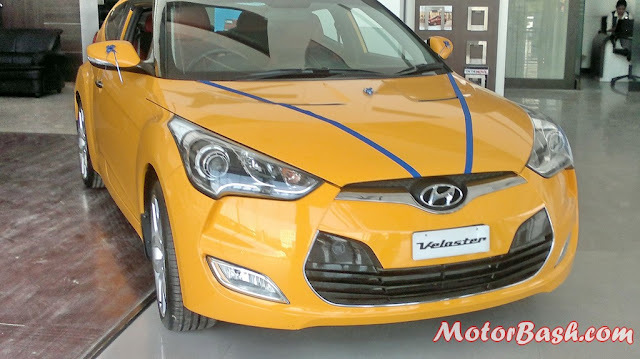 The car is a 3-door Yellow colored variant displayed which looked pretty sporty and in line with Hyundai's fluidic design language. Apart from regular two doors, the third door was on left side of the car, just behind the co-driver's entry gate and could be opened as the opening handles found in Beat. The car seemed to be manufactured at Korea since on tyres and some of other places, stickers having information in Korean language were found. On the outside you could see the fluidic design language along with which large alloys fitted on Hankook tyres. The overall looks are superb and the falling line at rear side of car looks fantastic. However, for the rear passengers it was a difficult situation to enter and exit in the car due to demerging roofline. On the inside, there were black & red profiled sporty leather seats. The dashboard too was in black however it matched with overall design philosphy of other Hyundai cars. Hyundai Veloster is powered by a 1.6L GDI petrol engine which is offered in regular naturally aspirated from and with a turbocharger. The regular variant produces 138hp of power and 167Nm of torque whereas the turbocharged Veloster produces 201hp of power and 264Nm of torque. This particular car was mated to a 6 speed manual gearbox. You could have a look at other Images of Hyundai Veloster here and do share your comments / feeds on what do you think about this car !